Bio: "An insight to emptiness and melancholy, but also aspiration and a subtle enchantment. This is not a music for trend-followers, no worship of senseless dreamings, Bosque is the audial melancholy of souls." When it comes to the funeral doom metal style, there are plenty of new bands throwing their hats in the ring. One of them is the Portuguese solo act Bosque, helmed by a man calling himself DM, which stands for Daniel M. While not the freshest of acts to surface in the style, the project did bring a little something fresh to the mix that wound up a bit lost with the rise of the raw black metal style, which was just as primitive and analog an approach as many of the groups in that very type. Since then, there have been a few splits, an EP, two demos, and two full-length efforts unleashed, all of which receiving a mixture of mild to high praise. Now, working with Dunkelheit Produktionen, Bosque returns with a brand new three song album titled Beyond. But is it really all that it’s cracked up to be, or does the lo-fi style act more as a detrimental barrier than any sort of positive addition? If you’ve ever heard a bootlegged live performance recording in your life, chances are you’ll know exactly what to expect. Beyond basically sounds like someone set up a small tape recorder near one of the speakers during a live performance where everyone thought it’d be funny to not tell vocalist DM that his microphone was off, or at least set incredibly low in the mix. Yes, it presents a far more analog presence in that it sounds like a live recording, and you could argue it was done that way in hopes of achieving the atmosphere of a ritual being done right in front of you, but while it does achieve that to some degree, it’s almost impossible to sit back and say that this effort actually sounds any good at all much of the time. In fact, when just starting out, it can turn you away almost immediately. 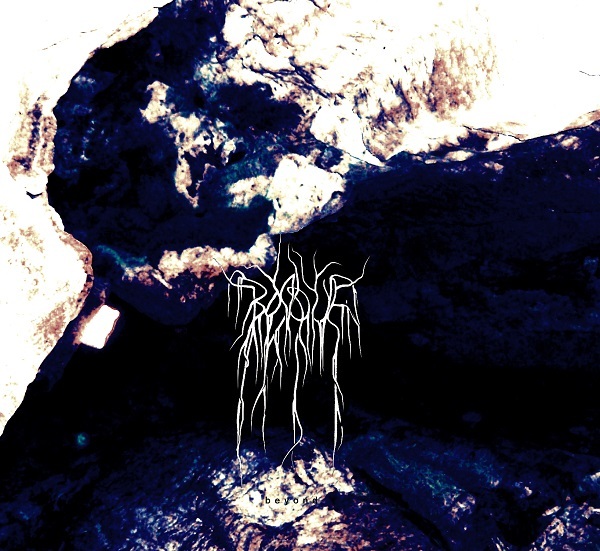 “Calling the Rain” spends about a minute setting itself up to be a dismal, potentially drone filled effort, quickly shifting gears to more of a slow-moving depressive black metal territory complete with frozen lakes and suicidal intentions in the atmosphere. That blackened touch coupled with a decent amount of echo, however, becomes its undoing. 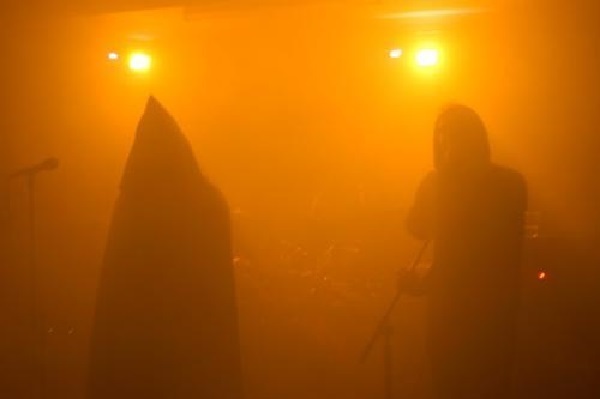 What follows sounds like a terrible mixture of the aforementioned style with a Tyr-like folk metal influence that captures the slower nature of the funeral doom metal genre, but lacks any genuine spirit behind it once the actual song kicks in around the three-minute mark. In fact, when things grind to a halt five-and-a-half minutes in, you’d imagine it was some kind of first month guitar student’s performance at a high school talent show. There’s no real sadness, there’s far less atmosphere, and the chanting vocal approach sounds more like someone recording the bouncing audio waves of someone singing into a large tin can that oddly enough sounds close enough to a deeper voiced cat howling in the distance that every time this song started my cat walked into the study looking around for the other four-legged creature in hopes of befriending it (or so I assume was her intent, I don’t know). “Enter” does manage to clean things up a bit and offer up a colder environment overall. The problem is that, while it sounds superior, it ends up more of a generic offering with traces of early melodic black metal influence on par with the first two Dissection albums. The only thing really going for this one is the random psychedelic bouts, such as approaching seven minutes, but even then there’s little to really keep the listener engaged, or even the vocals it seems, as they come through completely disinterested in this fairly cliché performance until about eleven minutes in where it seems a darker Metallica influence is pulled into the mix to liven up the party before the set ends and the reverb of unplugging instruments filled the auditorium for the last-minute. There is, thankfully, one glimmering hope to this album, and it’s “Paradox”, which actually sounds pretty good overall. The tuning on this performance is much lower, which greatly benefits that rawer live presence in making you feel as though you’re standing at the grave site of someone who might have died in battle, all the while some band in the distance is coincidentally performing a piece written about his or her adventures. There’s no sharper, higher pitch notes present, and the tuning of the guitar sounds better as opposed to the many chords that sounded off-key for that reason, or just from the recording quality in general, if not both. The drums also fill things out nicely, restricting the cymbals a little more outside a random spot here and there, and the vocals are held back for the most part as well. About ten minutes in, however, the music begins to creep along, and the cleaner chanting is pulled to the forefront, which is where you can really spot the tone-deaf dual layered harmonizations, making the next minute like sitting bare assed on a particularly abrasive piece of sand paper. Instead of something that could have been a competent solo album is one that resorts to a gimmick that isn’t really suited to this particular brand of metal, leaving behind a trail of moderate blandness and often boring music that can summon cats randomly in its wake. Yes, Bosque has done this on past recordings, but those at least felt genuinely monolithic and foreboding. Hell, listening to Nowhere feels as though you’re sitting in a Scottish plateau surrounded by structures with reasons for their creation lost to time and speculation as you become one with the spectral realm surrounding you. Beyond, however, does not. In comparison, it sounds like the end result of a few high school kids putting on a show in their high school cafeteria after a few months of studying their instruments with their parents showing their “mandatory” support with the fathers recording on an old VHS camera and talking among themselves in the back, eventually ripping the audio onto their computers, burning a disc for the kids, who in turn decided to slap it onto Bandcamp and ask for more euros than it’s probably worth to most. None of this is to say Bosque is not a good project – their back catalog is actually quite impressive and far better handled as far as the recording and post production aspects go – but that Beyond will cause anyone who just discovered the one-man project to believing it’s just another gimmicky, amateurish creation hoping to be “kvlt as fvck” [which is exactly what happened with this reviewer before checking out the aforementioned previous releases, so it’s not as far-fetched as you would like to believe]. Digital review copy of this release provided by Dunkelheit Produktionen via Against PR.